This list includes individuals who filed for a chance to receive a homestead in the August 1901 land lottery held at the El Reno and Lawton Land Offices. These lottery tickets are presumed to be those who were unsuccessful in gaining a piece of land. Out of the more than 74,000 entries, less than 100 are included in this list. 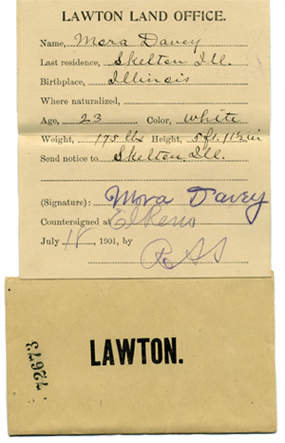 There is a genealogical value to this collection, as the tickets include the name of the individual filing for the lottery; their last residence; their birth place and if they were naturalized and where, their age, race, weight, height, and where to send the notice if the person was successful in securing a parcel of land. There is a place for the individual to sign the ticket, and the location and date of the signing. To order copies or scans of land lottery tickets by mail, use the printable order form.